Black LED Starlight Dance Floors distinguish the elegant of elegance. This floor is highly suited to all weddings, corporate use and much more. Adding the floor to a Black LED Backdrop will certainly enhance the event, throw in a bit of LED Uplighting to bring some colour in will take your Wedding or private party into pure elegance. 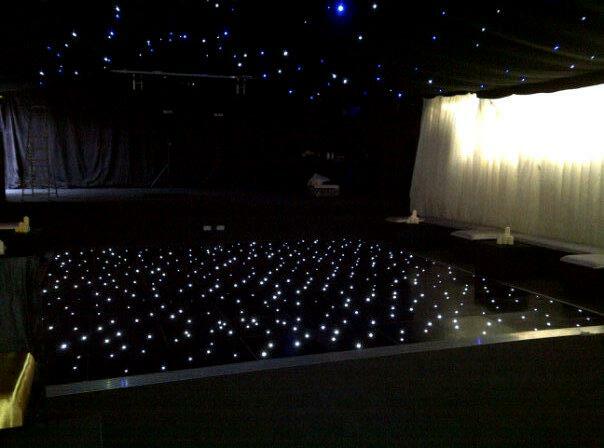 We can cater for Black LED Starlight Dance Floors up to 24ft x 24ft, which typically can hold 120+ guests dancing. Add our Professional Wedding DJ to bring some amazing music and you will that amazing dance floor full and create one night that your guests will definitely remember. Black LED Starlight Dance Floors are available throughout the UK with our without our Professional Wedding DJ in The East Midlands and including Derby, Burton on Trent, Stoke on Trent, Nottingham, Leicester, Manchester, Liverpool, Chetser, Preston, Blackpool, Carlisle, Newcastle upon Tyne, Durham, Middlesborough, Leeds, Bradford, Wakefield, Glasgow, Edinburgh, Scotland, Inverness, Kettering, Northanmpton, Milton Keynes, Coventry, Rugby, Luton, Hemel Hempstead, Welwyn, Hammersmith, Totenham, Wembley, Kent, Essex, Brighton, Portsmouth, Bournemouth, Swansea.